Are you looking for some Rollei filters? We have a basket of filters for sale!! 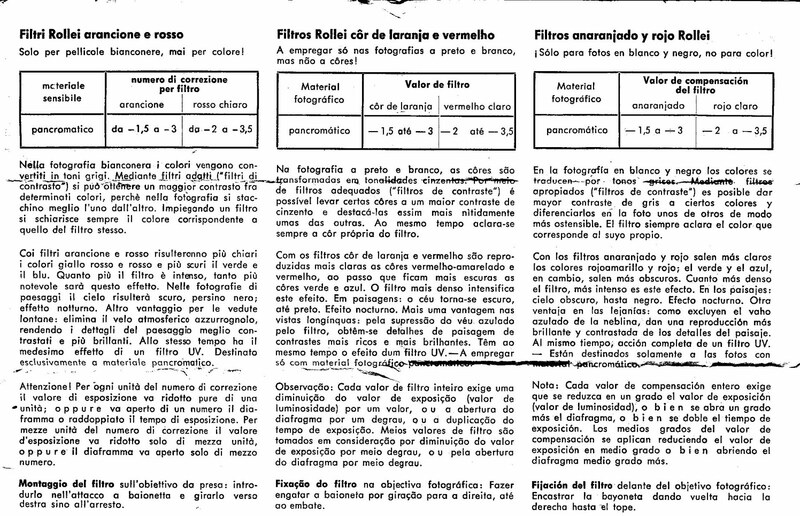 Note: Rollei TLR cameras Infra-red filters are already compensated for the IR photography focus shift. Rollei filters rings were marked with Exposure Values compensating numbers after Rollei started to use Compur shutters and cameras with the Exposure Values System (EVS), these numbers were used for Rollei TLR, Rollei 35, Rolleiflex SL 66, Rolleiflex 35mm SLR, Rollei SLX/6000 and other cameras B&W filters (see EV numbers and equivalences in the table above, click on thumbnail). Rollei B&W filters rings were engraved with different words along the years, pre-war filters up to about 1937 were clip-on type, earliest Bayonet I (1938), II (1949) and III (1952) filters have the filter diameter marked in the ring, the filter type, “Rollei” and “Germany” and “Franke & Heidecke”, from about 1953 a red “R” indicating coating replaced the diameter mark, a black “R” replaced the red one afterward and from 1956 the marks were “R”+bayonet size, “Rollei” and filter type, “Germany” and the EV compensating number. 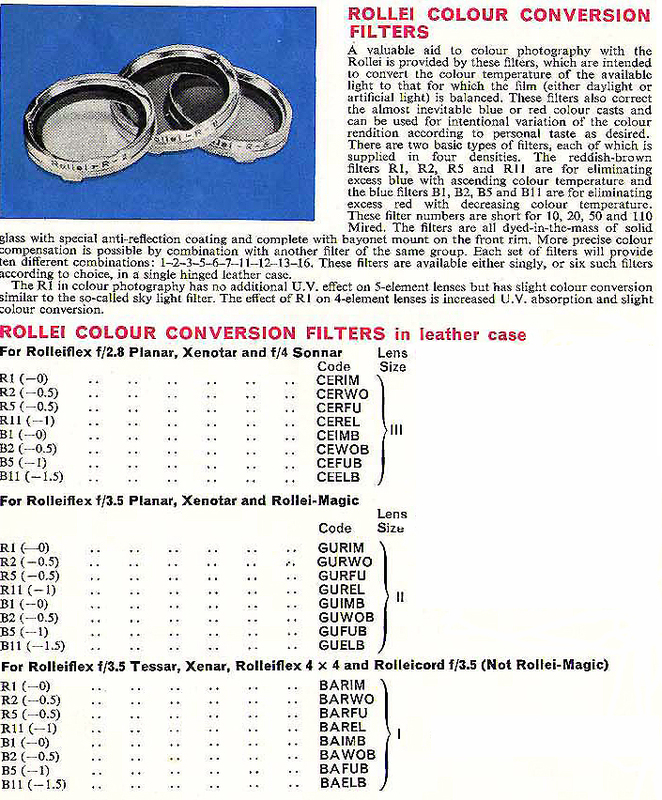 The photograph above shows: “A”: R(bayonet) II UV filter engraved like filters from 1956 but without EV number mark, some -0 filters have the mark anyway. “B”: This B III filter is older than “A”, it has the red “R” without bayonet size and it does not have the EV compensating number mark. 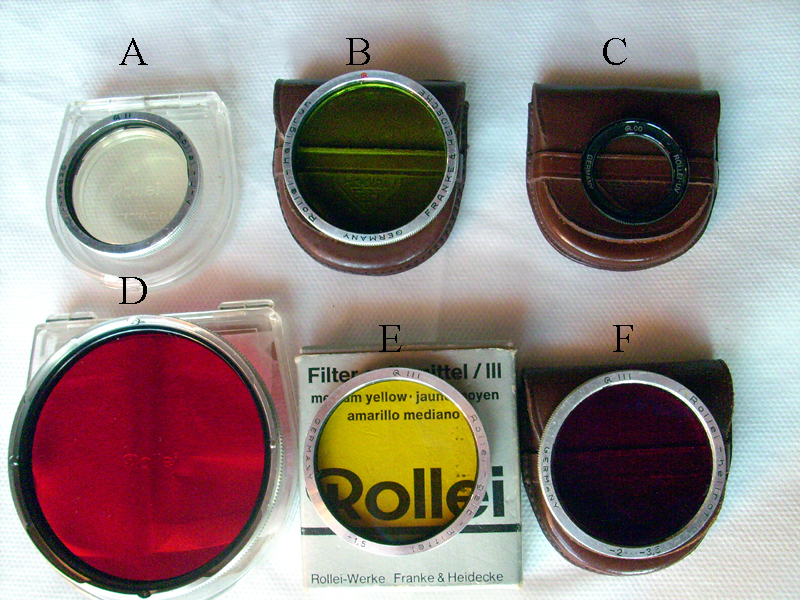 “C”: Rollei 35 Tessar UV filter marked “R00”, “Rollei UV” and “Germany” without EV number, however other Rollei 35 B&W filters have the EV number mark. 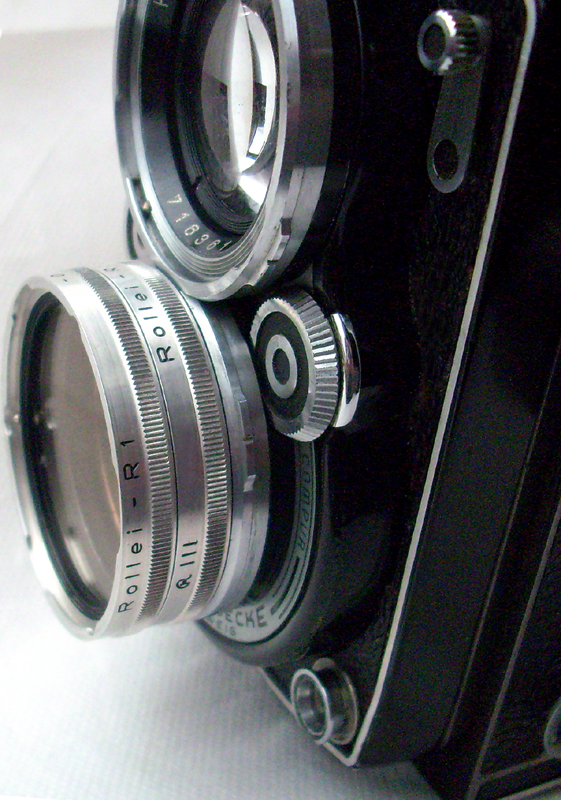 “D”: SL66 B VI light red filter, it has engraved “Rollei-hellrot” (light red), “-2 -3.5”, “R VI” and “Germany” in the filter ring edge (no visible). “E” : B III medium yellow filter marked as described for filters from 1956, this filter box is different regarding boxes from the “F&H” era, it has the “Rollei-Werke Franke&Heidecke” company name and then it is at least from 1964. 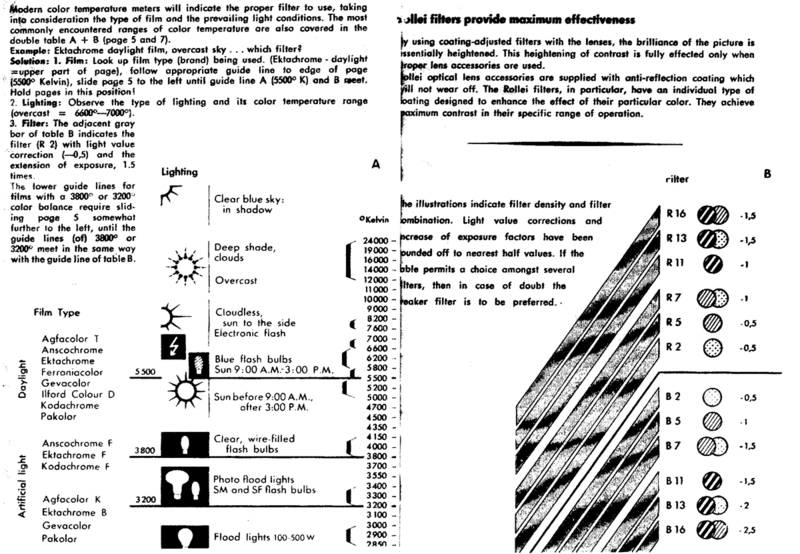 “F”: A BIII light red filter, it is engraved like the “E” but it is older, from the “F&H” era. (click on thumbnail). 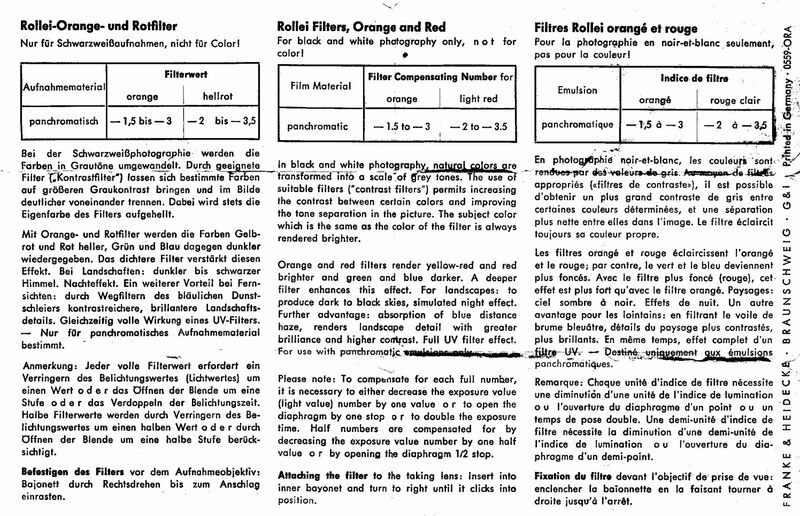 Rollei colour conversion filters for colour photography were made from 1956. 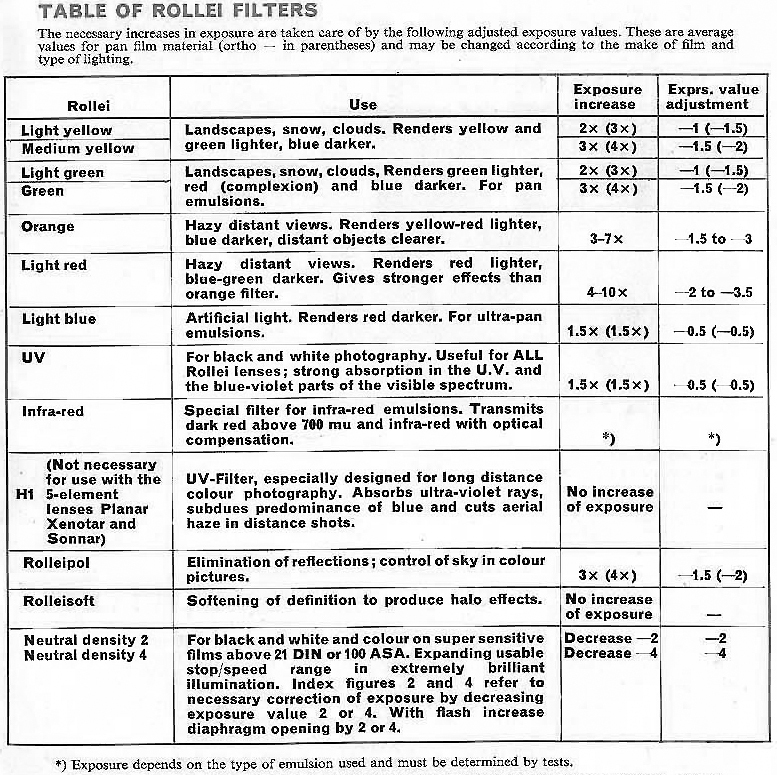 The image shows my 2.8C Xenotar with a Rollei R1 (R10) and R5 (R50) filters fitted together on the Xenotar making an R6 (R60) filter (see the tables below to read about the Rollei colour conversion filters system, click on thumbnail). 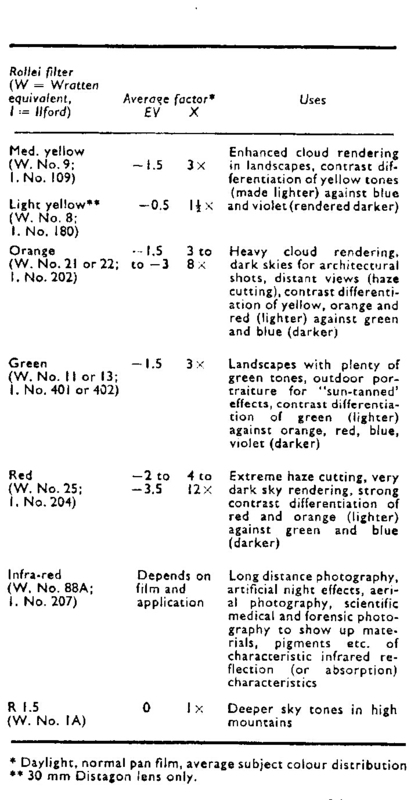 The table below gives approximate filter factors for a variety of common photographic filters. What’s the purpose of a Rollei Sport Filter?